Fireflies or Lightning Bugs, whatever you choose to call them dose not change the fact that they can put on one of the most spectacular nature light shows in the Smokies, maybe even the nation? The Synchronous Fireflies event is going to be from June 6th through June 13th, which is this particular species of fireflies projected mating season. During this mating season the fireflies pair up the lighting patterns and turn the night sky into a light show that you will never forget! If you are going to be in the mountains during these dates I highly recommend that you go to (http://www.nps.gov/grsm/naturescience/fireflies.htm) and reserve you parking pass. The only access to Elkmont after 5pm during these dates is via shuttle and you must have a parking pass to park and ride the shuttle, so you must plan ahead, and this event is very popular so book early. Synchronous fireflies (Photinus carolinus) are one of at least 19 species of fireflies that live in Great Smoky Mountains National Park. They are the only species in America whose individuals can synchronize their flashing light patterns. 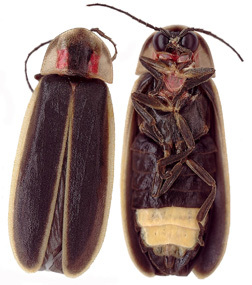 Synchronous fireflies produce light in their lanterns, the pale area of the abdomen visible on the underside of the insect above. The production of light by living organisms is called bioluminescence. Fireflies are a good example of an organism that bioluminesces, but there are others as well, such as certain species of fungus, fish, shrimp, jellyfish, plankton, glowworms, gnats, snails, and springtails. Bioluminescence involves highly efficient chemical reactions that result in the release of particles of light with little or no emission of heat. Fireflies combine the chemical luciferin and oxygen with the enzyme luciferase in their lanterns (part of their abdomens) to make light. The light produced is referred to as a “cold” light, with nearly 100% of the energy given off as light. In contrast, the energy produced by an incandescent light bulb is approximately 10% light and 90% heat. The mating season lasts for approximately two weeks each year. The dates that the fireflies begin to display varies from year to year-scientists haven’t figured out why, but it depends at least in part on temperature and soil moisture. It’s impossible to predict in advance exactly when the insects will begin flashing each year. Again if you are going to be in the area you need to experience this. Elkmont is located on the Tennessee side of the park so it is a great opportunity to spend a day in Gatlinburg or Pigeon Forge and then catch the shuttle on the way back across the mountain.